Conveniently located minutes from Soldotna and the Kenai River. We offer "condominium" style lodging tucked away in a quiet natural forest setting. The suite includes a full kitchen, tub/shower bathrooms, extra long twin or king beds, and spacious living area with Direct TV and Wi-Fi. You can choose to prepare your own meals or dine out at one of the many fine restaurants found throughout the area. Spend your evenings around the campfire sharing your fish stories and roasting a marshmallow, or bring home the daily catch and use our bbq grills to cook it to perfection. Coin operated laundry facilities are on site and housekeeping is provided. Spruce Haven Lodge is the perfect location for families, groups or individuals who like to do things "their own way." It is our second time staying at this property and we are just as impressed now as we were the first time. It's immaculately clean, has all the amenities, plenty of room, and is close to town. The owners are friendly and responsive to any questions we may have had. I highly recommend staying here for sure! title pretty much sums it up. Nice and clean, everything we needed was there, and it was only a few minutes from town. Nice location as well. Will pick this place again when we come back. Was pleasantly surprised at all of the little amenities and attention to detail. The condo was clean, safe, and in a great location! Not impressed with VRBO's fees or the sneaky way they charged some of them. Will not be booking though them again. We loved staying at this property. It was very clean, comfortable and felt like being home. The host is amazing. We will definitely stay there again. Our stay at the Spruce Haven Lodge was short but great. The hostess, Ginger, was response to all questions prior to the stay and even more helpful once we arrived. The "condo" had more than we could have asked for, was extremely clean, and in overall great condition. 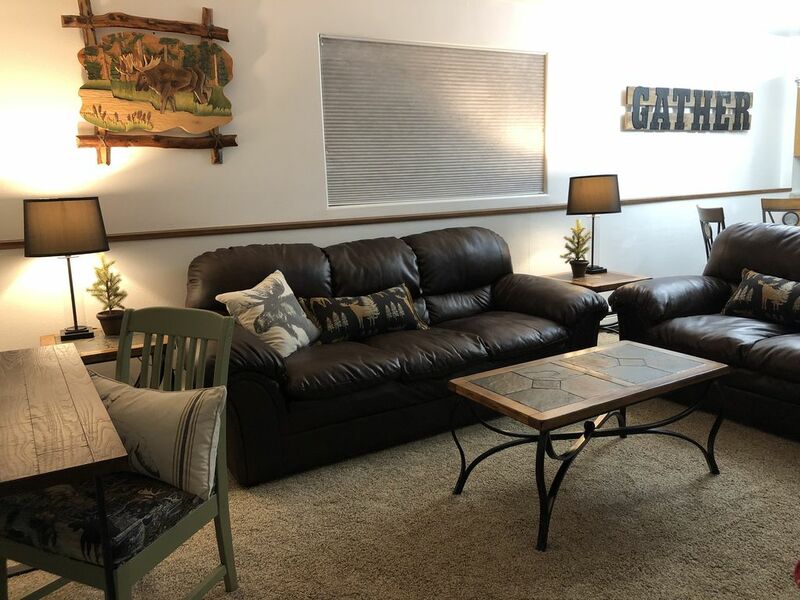 The location allows for easy access into Soldotna and ultimately fit our family of 5 perfectly. I would highly recommend anyone looking for a place near Soldotna stay with Ginger and Spruce Haven Lodge! Great apartment/condo rental for our family. We loved it! Our expectation is that you treat our home well, and leave it in as good of condition as when you came. Pets are welcome with pre-approval, but there is a $50 non-refundable pet fee, per pet, per trip. If you are bringing a pet, we ask that they not be left in the unit unattended, and when you take them outside our rental they be kept on a leash at all times. Smoking is strictly forbidden! If we find that our rental has been smoked in, you will be charged a $250 fee.